I always thought that I hated beets. It took me most of my young adulthood to realize that I hated the way my mother always served them to me, cold and from a can. 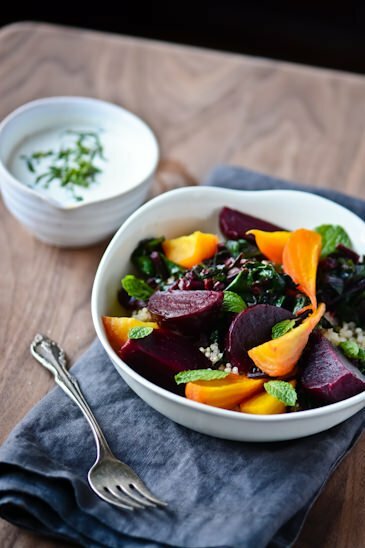 Beets are one of my favorite and one of the most versatile ingredients in my kitchen, they are delicious raw or cooked, can be added to juices, baked into cakes or simply roasted with a little olive oil. Most people discard their beet greens but it’s one of my favorite parts of the vegetable. 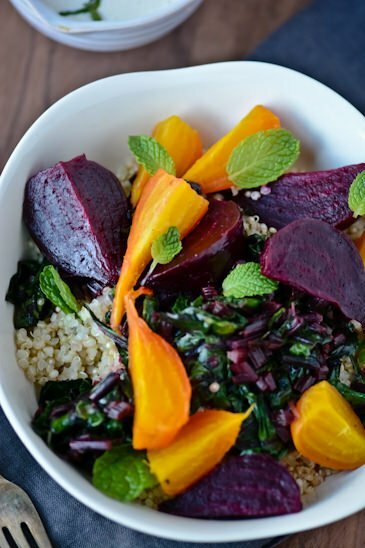 When it comes to beets I like to use the whole thing, the greens, the stems and the root. 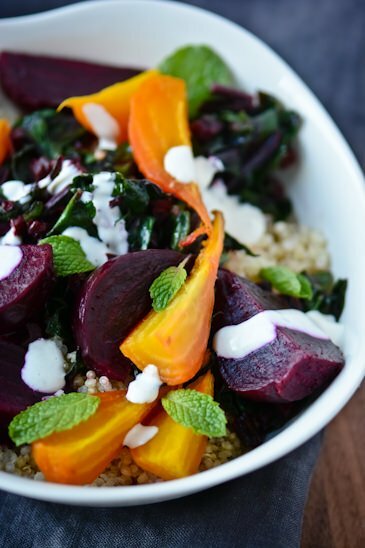 Here I’ve roasted the beets and sautéd the stems and leaves, and layered them on top of quinoa. The yogurt tahini dressing is tangy, pungent and one of my very favorite dressings. If you mix all the ingredients together in the bowl it will turn the most delightful shade of pink you have ever seen. In honor of Valentine’s Day, I think I”ll call this my bleeding hearts beet bowl. Pre-heat the oven to 375 degrees. 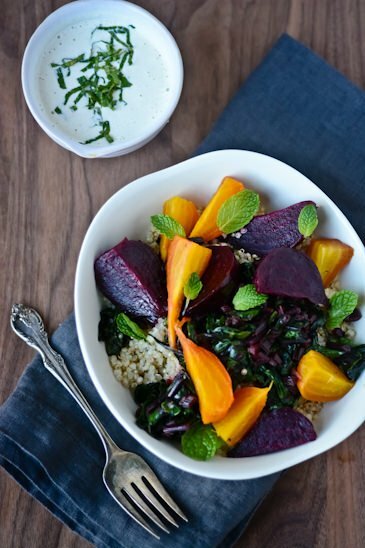 Rinse the beets, trim off the leafy tops and set aside. Place the beets on top of a large piece of aluminum foil, drizzle the olive oil over the tops and season with salt and pepper. 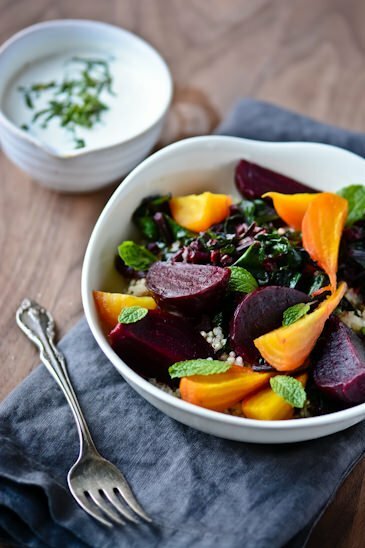 Wrap the beets tightly in the foil and place them on a rimmed baking sheet. Roast the beets until tender and can be easily pierced with a knife about an hour. Let cool slightly and then using your fingers or a small paring knife peel the skins off the beets. Pour the remaining tablespoon of olive oil into a skillet over medium heat. Cut the beet stems into small pieces and add to the oil, cook for 3-4 minutes until they begin to soften. Slice the beet greens into ribbons and then add them to the pan along with the stems and season with salt and pepper. Cook for 3-5 minutes until the greens are wilted. In a blender place all the ingredients for the dressing and process to combine, taste and add more salt or pepper if desired. 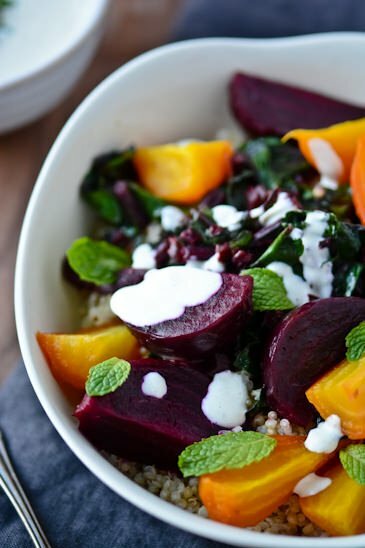 Divide the quinoa, beet greens and beets among four bowls. Top with a tablespoon or two of the tahini sauce and top with the fresh mint. This looks amazing! Did I miss it or did you leave out the roasting instructions for the beets? Thanks. No, you didn’t miss anything I just forgot to write the complete recipe. It’s been updated so you should be able to use it if you’d like. Thanks for checking out the blog! This was delicious! Needed to use up some leftover black rice so I stirred it into the quinoa at the end. One-bowl meals are our go-to weeknight dinner so this was right up our alley. Thanks Tina! That sounds wonderful. I love one bowl recipes. I’m all about throwing whatever I have in the fridge together and having a sauce to bring it all together.